Simply Silhouette: "It's My Party Blog Hop and Live UStream"
"It's My Party Blog Hop and Live UStream"
Join us for the live UStream from Alex’s house. Yep! We're all going to be there together! on any of the awesome blog candy either! at the end to be eligible for the grand prizes! Thank you to all of the awesome sponsors! get started until the Cupcakes come out! from the Cupcake Wrappers Lite Cartridge. Sweet Treats Cartridge to use as a topper! Cupcake on card is from Sweet Treats cut at 2 3/4"
Sentiment is from "Pink By Design" "Scripted Year"
Thanks for Hopping and I hope you are enjoying yourself! LOVE all your projects!!! The cupcake holders are just too cute!!! WOW, you have outdone yourself!! This is just adorable!! How cute this would be for any type of party!! Love it! Already a follower!!! Wow those cupcakes just made me hungry! They look great :). I'm a follower, thanks for the chance to win. My email contact is in my profile. Love the cupcake topper.. Everything you made looks amazing.. Im a follower.. TFS..
OMG those cakes look so yummy! And the card and decorations look good enough to eat! I'm a new follower, and i'm grabbing your button! I love your cards and cupcake holders. I'm already a follower and have your blinkie on my blog! :o) I always enjoy seeing what you create! Have a great day! YUMMY!! The cupcakes look divine and the cards are cute as a button! I grabbed your blinky and became a new follower. I look forward to seeing what other projects you have in store for us. Thank you for sharing your talent with us. super duper cute! Cupcakes are my favorite and those look yummy! What darling cupcakes!! Great idea! Those are just darling--and now I have TWO carts I must get today. Sign . . . !! Thank you. Every thing looked so good. Wish i could go to the party. I am already a follower and already have you blinkie. Lovin the pink and green cupcake holders n hats..Gotta pass this page on to my daughter who just completed a cake making class and loves to bake and decorate cupcakes. Now she can take it one step further. Thanks for sharing... Keep up the creativity. These look soooo yummy, what a fabulous party set!! Oh my goodness..those are just too stinkin cute! Thanks for sharing this adorable idea! I'm a follower too..don't have a blog or I'd love to add your blinkie! you are too cute! the cupcakes are adorable and that yummy frosting. The wrappers are so cute! And the blog candy is awesome! Thanks! Soo cute.. My grandsons bday is coming up and these would be a great hit... Love them. I love your ideas. I have all the cartridges but never would have put it all together like you did. Thanks for the help!! 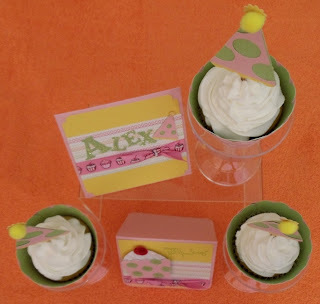 Very cute project, love the party hats and cupcake toppers...too cute! TFS!! Love it!! So cute!! TFS! How cute!! Now who gets to eat the cupcakes?? Very cute cupcakes, love that you added the hats too. Your cupcake projects are just adorable! Love the cupcake toppers. Now I want a cupcake! LOL. I'm a follower. Love your projects. They are super cute! I am a new follower, and I am going to try to grab your blinkie. I am slightly blog challenged! : ) Thanks for sharing! Super cute projects and great giveaway. Thanks for sharing and the chance to win. I'm already a follower. Wow wish all of this had been around 30 years ago for my children's birthday. Wonderful card, wrappers and party hat. I am a follower, and will put your blinkie up. Love your cupcake holders and card! MMM those cupcakes look yummy! TFS I am a follower! What a way to dress up a party, great job!! Wow so cute. what a great idea for it all to go together. thank yo for the ideas and sharing. I love it! Very cool to see how everything from the card to the cupcakes flows together! I'm doing cupcakes for my daughter's birthday party in March so it was cool to see everything flowing together so well! Thanks for sharing! chrisbrown1973@hotmail.com. Just became a follower! What SWEET projects - I especially love the party hats! I'm a follower! After this I want to make some cupcakes! I am following your blog via facebook. Ummm...JULIE! This is AMAZING! I LOVE LOVE LOVE the party hat toppers for the cupcakes! What a great project! I came together so nicely! I now want to skip breakfast and have some cupcakes! Cupcakes in place of the cake is in, I wish I will be able to get the carts for myself coz I want to dress all the cupcakes to go with the party theme. Thanks! 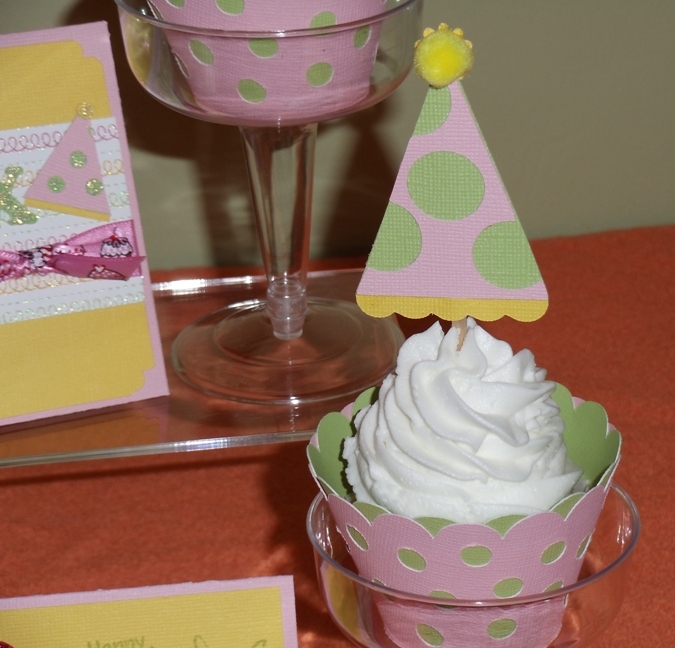 I love the party hat and the cupcake holders...You did such a great job on this. WOW! You really went all out, and yep my tummy is even grumbling. Im on a very strict diet until April. Great job. LOVE the cupcake wrappers! The cupcakes look so darn good! All I can say is "YUMMMMMMMMM!" Thanks for the chance to win! So sweet! What a nice presentation! I'm already a follower of your blog and I would love for you to stop by mine too! For anyone interested...I am giving away a Cricut Cupcake Wrappers cartridge AND a Cricut Love Struck cartridge on my blog! WOW! I know alot of work went into this! so cute and sweet too! enjoy your get together today! Your cupcake and polka-dots are so cute. Great for a party! Wowza! So very unique! I love this idea! so sweet :) lol,loving it. These are so cute, TFS! I love those cupcake wrappers. I am a new follower.I like the "hats" on the ccs. I also have a blog: www.KrsitasPaperCafe.com and would be honored if you would drop by sometime. I am a follower. 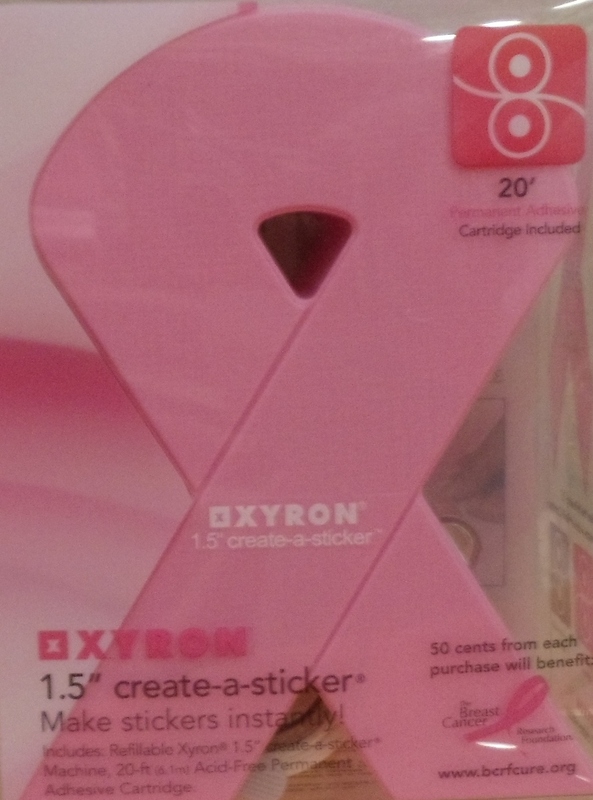 The cupcake wrappers are so cute! and I love the party hat topper! OH WOW all of these party items are great! I love that they all match super cute you did an amazing job! thanks for sharing. Now that looks like a party! Great cupcake holders. adorable, I have to get me that cart!!! Great cupcake holders, my daughter loves to bake cupcakes so I think she would love making these just as much. Thanks for sharing with us. EEKS! This is to CUTE-UH! I love how everything coordinates. Wonderful Project! BTW Im loving that new blog button! Fits you very well. SO cute! Love the cards and the yummy cupcakes:) TFS! great project, everything is so cute! Just the way I like them...lots of frosting :D Alex will love her card too. Great job on everything. Thank You for being in the hop and for chances to win great prizes. Love the cupcake holders. I like how everything ties together even though you used different cartridges. Definitely looks like a fun party in the making. I always wanted to see pictures of these cupcake wrappers. Looks like you had a blast making them! Look at all that yummy frosting! So sweet. 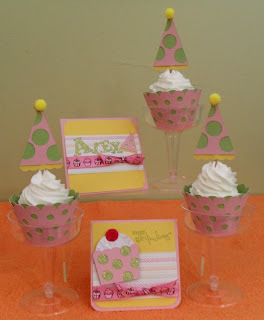 I love the cupcake wrapper and topper. What a darling project!! I love it! TFS! These are sooooo cute! I love it! these turned out very cute. thanks for sharing. HOW EXCITING! You have A LOT of awesome prizes! I'm already a follower. :) Thanks for a chance to win! I LOVE the cupcake wrappers, the pink and green go so well together. You did a great job! Are the cup cakes choclate? They look sooooooooo good! I also like the projects you made! Love the project! So festive!! This is fantastic! I love everything about these!! and cupcakes re my favorite!! TFS! Oh wow, love the wrappers and everything else! Awesome job :) TFS! So cute!! Now I want a cupcake! I just signed up to be a follower on your blog. Thanks for sharing. Yummy, they are very cute, tfs. I want to reach right through the computer screen and grab a cupcake - darling and yummy at the same time. TFS! So cute and the colors you chose are beautiful! cute projects. definitely ready for a part. thanks for sharing and thanks for the giveaway. That is fabulous! My brother gave me a cupcake holder for Christmas, I never thought about putting party hats on them, so cute, so I must try it! Great job on the card and the cupcakes. Wish I was there to eat one, because they look so yummy! I am a follower. Great job on the cupcake treats...now were you guys eating these cupcakes during the UStream? Love the cupacke topper idea, thanks for sharing. YUM! Now I need to make cupcakes! This is just adorable. TFS, What a wonderful project. That is adorable! What a cute birthday project!! I am a new follower!! Oh how SWEET!!!!!!!!!!! Just yummy!!! It was nice to 'see' you ladies. Everyone looked like they were having such a great time. Super cute cards & cupcake holder! Thanks so much for sharing them with all of us! What a sweet treat. I know you ladies loved the cupcakes. TFS and the chance to win! Love the cupcakes and how everything matches! Great job! I love your wrappers, they are so cute. I'm having so much fun on the blog hop. adorable, adorable, adorable! That is all I have to say! Your card and cupcake sleeves are just awesome!! I love it!! Where did you get the cupcake ribbon from? OMG!! So cute and I love the way to displayed your cupcakes. What a great idea!! Thanks for a chance to win. These are cute I can not wait for my daughters first birthday to make some for her party. Thank you for the chance to win. Love your ideas, they turned out sooo cute!!! I also love the color combo!!! Thanks for a chance at your blog cany!!! just love the cup cakes you are very creative. Wow! How very sweet! I love the cupcake wrappers. Thank you for sharing! Great cupcake wrappers but How did you get the cupcake with all that frosting in the wrapper with out getting the frosting all over the wrapper?? WOW!! Very cute and they look very yummy! Tfs! The holders are so cute, and that cupcake looks yummy! I saw those at WM today and couldn't decide on getting them or not. This whole 'collection' is so cute. Thanks for sharing! Very cute cupcakes.. Love it all.. Thanks for sharing. I am a new follower! That is a great project. Do you have a "subscribe by email" button on your blog? Very creative...thanks so much for sharing! YUMMMMMY-licious!!! Awesome projects you did and your presentation.. AWESOME!!! I already am a follower and LOVE IT!!! Totally love EVERYTHING you made!! So super Sweet!!! Love the colors you used!! TFS!!! I'll take a dozen of those yummy cupcakes. Those wrappers and hats are so adorable. I love it. Thanks for sharing. Cute project! Those cupcakes look delicious. Your whole set is adorable! I love the way you put little party hats on the the cupcakes! Too Cute! Thank you so much for sharing! Contact Info: incase I get luckey enough to win those amazing candy prizes! New Blog: I love new friends come check me out if you get a chance! Its fairly new, so not to many things yet! those cupcake holder are just too cute!! I love your super sweet projects! Awsome projects...I love them! Funny, I feel like eating a cupcake! Thanks for the chance to win! Those hats in the cupcakes are so cute!!! I kept hearing about cupcake papers but hadn't seen any, TFS! This is so cute! I will have to try this myself! This is awesome idea! Lovin' it all! Thank you for a chance to win! I am a follower. Mmmmm cupcakes. Great projects. Thanks for sharing. Yes, my mouth is watering! It all looks delicious AND adorable! Beautifully Yummy!! Thanks for sharing!!! So cute! The cupcake wrappers are wonderful! Love the wrappers and card! I would love to own the sticker machine, it would make is much easier to but together Cricut images! OMGosh!! So so cute ! Cute idea! Loved the yummy cupcake holders! WOW!!!! Alex is so lucky to have you as a friend!!!! Thank you so much for caring and sharing!!!! Thank you for the chance to win! Your cupcakes with the pretty wrapper sure do look Delicious. Your cupcakes are very cute. I love how you used the glasses to display them. I even bought the easter cart to try these and haven't done it yet. You have inspired me to try it out. Love the Cup Cake Wrappers!!!! I need that cartridge! Very Cute! Sooo cute! Love the cupcake decorations!! So excited to see this cartridge in action! LOVE IT!! So appreciate your creativity and time you spend sharing with all of us! Big Hugs! You did such an amazing job! I love the presentation as well! Love your projects and the display! Thank you for having this blog hop. It was the first time I've ever done one and really enjoyed it. With this being my first one I did make and error and posted a comment on Joanna's (scrap-making) blog first. Thank you again for the fun blog hop.